Legendary musician Booker T. Jones performed with acclaimed new band Vintage Trouble on Conan last night. Check out the incredible performance HERE. 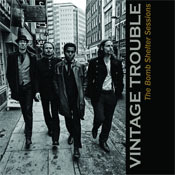 Currently on tour with The Who, Vintage Trouble will spend most of 2013 on the road performing songs from their acclaimed debut album The Bomb Shelter Sessions. Beginning on March 1 in Pittsburgh, PA, the band will embark on a short headline run before SXSW and a performance at this year’s Coachella.